Home » News » Improve Morale, Rafaam’s Scheme, & Omega Devastator Revealed From Rise of Shadows! 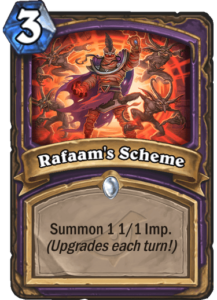 Three new cards have been revealed from Rise of Shadows: Improve Morale, Rafaam's Scheme, and Omega Devastator! We've got a couple of spells, and one minion that gets better later in the game. 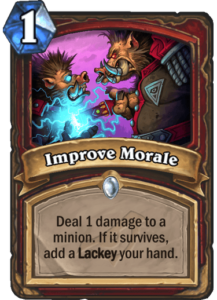 Improve Morale is a 1-Mana Warrior spell that reads: Deal 1 damage to a minion. If it survives, add a Lackey (to) your hand. 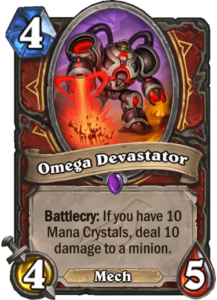 Omega Devastator is a 4-Mana 4/5 Warrior Mech minion that reads: Battlecry: If you have 10 Mana Crystals, deal 10 damage to a minion.